This article describes the backup of files in wide area networks and low-bandwidth networks. Creating wide area networks by connecting geographically disparate local area networks brings organizations considerable savings. It ensures improved access to the central database for all branches of a company or institution, facilitates document flow, minimizes hardware investments and reduces IT maintenance costs. IT specialists are not required in every branch because, in most cases, remote administration is sufficient. 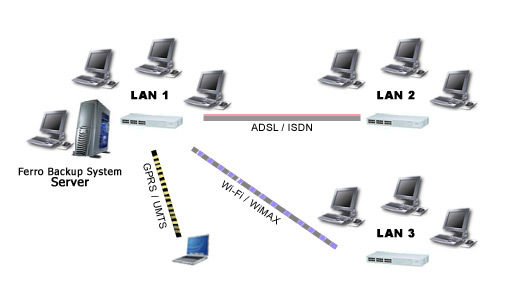 In building a wide area network, DSL, dial-up or RF connections (Wi-Fi, WiMAX, GPRS, UMTS) are most often used. Currently, long-distance connections are established due to their low cost factor over the Internet using DSL or ADSL connections and VPN tunneling. Backups in such networks can be difficult to carry out, especially without specialized software. The main causes of backup problems, especially for periodical backups, in addition to the limited bandwidth mentioned in the title, can be an unstable, interrupted connection and the risk of sensitive information becoming public. Ferro Backup System is based on client-server architecture. The client software (FBS Worker) runs on each backed-up workstation. Thus, all information is compressed locally, and so much less data needs to be sent over the network. For text documents (rtf, doc, odt), spreadsheets (xls, ods), databases with text entries (dbf, mdb, mdf) and mail files (dbx, pst) the average compression is approximately 4:1. This means that four times less information has to be transmitted compared to systems which compress information on the server. This is invaluable in the case of limited bandwidth networks, although equally important, if not more so, is selecting the appropriate range of information to be backed up. The extent of backup should always correspond to the network’s bandwidth. The term ‘maximum transfer’ referred to below applies to upload operations. Unfortunately most ISPs nowadays offer asymmetric lines whose upload speed is much lower than that of the computer. If the maximum transfer is greater than 348 kb/s, all files stored on the computer can be backed up so that, if need be, not only all user files but also the entire operating system can be restored (read: Operating system backup). In the case of networks with bandwidths of 256 kb/s or lower, only the most important information should be backed up, that is, user files such as documents, local databases and mail files. Afterwards, we need to choose the type of backup. If we are looking to reduce the amount of information transmitted over the network as much as possible, differential backup should be selected with the file fragment backup option active. With the differential backup switched on, all files will be backed up only during the first backup. Subsequently, only those files which have been created or modified since the previous backup will be backed up. Turning the file fragment difference option on greatly improves efficiency when backing up large files (mail files, database files), since only those file fragments which have been modified will be backed up, and not whole files. Workstation compression and differential backup are not the only advantages of the Ferro Backup System. Other problems which the backup system must contend with are unstable connections and the need to adjust the backup schedule to the availability of computers on the network. For WiFi or GPRS networks, the strength of the RF signal may fluctuate, causing breaks in the connection. If the network is down for a long time, the operating system will assume it has been disconnected and all active connections will be shut down. Ferro Backup System can handle such no-connectivity situations and interrupted connections. If the connection is interrupted during backup, FBS Worker will be disconnected from FBS Server and the backup process will be put on hold. As soon as the connection is re-established the backup process will resume from where it was disconnected. Everything is automatic and such emergencies do not require the administrator to take any action. Periodical unavailability of workstations scheduled for backup is yet another problem of wide area network backups (and others). Such unavailability may occur if the computer is out of the network’s range or is currently shut down. In this case the backup operation cannot be completed when scheduled, and an entry is made to that effect in the FBS Server event log. Ferro Backup System handles such emergencies seamlessly - as soon as the unavailable workstation becomes available on the network again, it is backed up. Such delayed backup is performed only once, no matter how many backup tasks were skipped due to the computer in question being unavailable on the network. Public disclosure of confidential information may be as damaging to a company as the loss of such information. Backup copies are made to eliminate loss of information, but the process involves transmitting that information over the network to the backup server. RF networks (WiFi, GPRS) or networks using the Internet are much more susceptible to interception than isolated local area networks. Networks with a heightened interception risk have built-in protections (transmission encryption, MAC or IP filtering). Using additional traffic separation mechanisms such as VPN considerably improves network security. Neither of the protective layers, however, will prevent interception from another computer within the same network, that is, an inside attack carried out by an individual (employee) having access to the corporate network. There are many information interception methods, the most popular being applications of the sniffer type. To protect against such attacks, transmission encryption at the level of the backup system should be used. Ferro Backup System supports three of the safest encryption engines: AES, Serpent and Twofish. After choosing one of these, the entire transmission of information from the backup workstation to the backup server will be secure. It is also worth noting that installing FBS Worker on workstations does not increase the risk of unauthorized access. FBS Worker communicates with FBS Server installed on the backup server with a TCP/IP protocol using the 4531 port. FBS Worker is a client and it is not necessary to unblock that port for incoming connections, so it is not possible to hack into a computer using the FBS Worker service. An administrator using Ferro Backup System only needs to secure one computer - the backup server - and only one open port (TCP 4531). A properly configured firewall, TCP filtering or IPSec protections are sufficient to ensure the required level of protection.